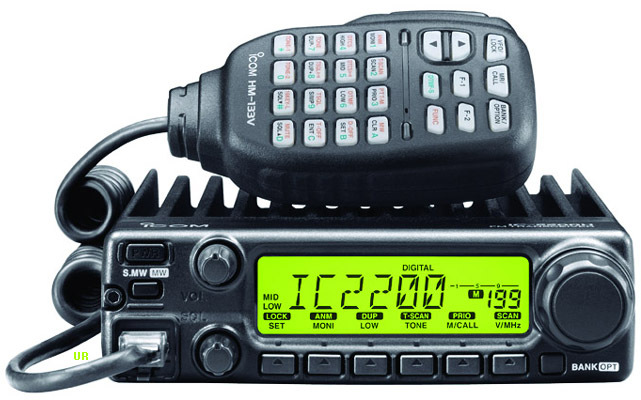 The Icom IC-2200H 2 meter FM mobile features a rugged design and an easy-to-read alphanumeric display. The large informative LCD may be set to green or amber. The receiver covers 118-174 MHz and the transmitter delivers 65, 25, 10 or 5 watts of output. The improved receive IMD helps provide protection from excessively strong signals such as pager signals. And the squelch attenuator (approx 10 dB) allows you to reduce interference from strong nearby signals. A winning combination for receive performance. The front panel has an oversized tuning dial is easy to grab while on the move and the large 4-level backlit display clearly provides key information at a glance. Memory channels can be assigned names for easy recognition and easy access. The IC-2200H supports three different scan modes: Full Scan, Memory Scan, Programmed Scan and four scan resume conditions. Other features include: 207 memories, alphanumeric notes, 3-way priority watch and independently programmable Rx/Tx and tone squelch. The 2200H is also one of the first mobiles to be GPS NMEA compatible (GPS not supplied). There is an external speaker jack on the rear panel. The IC-2200H is built rugged and has a convenient front mounted mic jack. The supplied HM-133V remote control mic controls everything in the palm of your hand. Icom's exclusive Hot Keys lets you program the features that you use the most. The bigger backlit keys allow you to operate in low light conditions. Requires 13.8 VDC at 15 Amps. A mobile mounting bracket, power cord and mic hanger are also supplied. Size: 5.5 x 1.6 x 5.9 inches 2 lbs. 10 oz. (140x40x146mm 1.25 kg). Click here for specifications. #4147 HM-118TN Electret condenser DTMF hand microphone with switchable Up-Down buttons.